US Release Date: March 17, 2006. Filming: from March 7th until late June of 2005 on location in Berlin, Germany and London, England. Plot Summary: In an alternate future in which Germany wins WWII and Great Britain becomes a fascist state, a mild-mannered young woman named Evey (Portman) is rescued from a life-and-death situation by a masked vigilante (Weaving) known only as “V.” Incomparably charismatic and ferociously skilled in the art of combat and deception, V ignites a revolution when he detonates two London landmarks and takes over the government-controlled airwaves, urging his fellow citizens to rise up against tyranny and oppression. As Evey uncovers the truth about V’s mysterious background, she also discovers the truth about herself — and emerges as his unlikely ally in the culmination of his plot to bring freedom and justice back to a society fraught with cruelty and corruption. – James McTeigue was first assistant director on the “Star Wars” Episodes II & III and the “Matrix” trilogy. 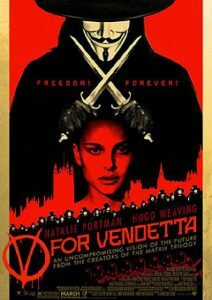 – The screenplay by Andy Wachowski and Larry Wachowski is based on the acclaimed graphic novel “V For Vendetta” by author Alan Moore & illustrator David Lloyd and originally collected by DC Comics as a ten-part series in 1988. – Produced by Joel Silver, Andy Wachowski and Larry Wachowski.